A la pêche aux moules, moules, moules, je ne veux plus y aller maman, les gens de la ville, ville, ville, m’ont pris mon panier… despite mon panier, I still want to go mussel fishing! 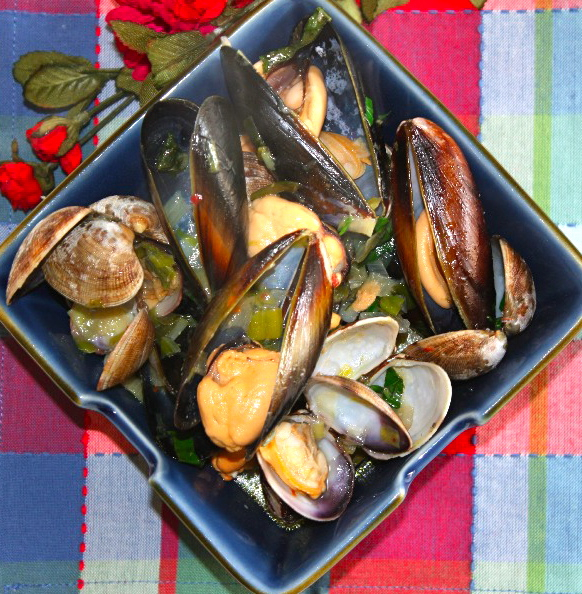 I am afraid I cannot stop eating seafood, it’s becoming an obsessive compulsive thing, I somehow realized the more you do something, the more you want to keep doing it…and right now I am dealing with eating mussels or anything that looks like a mussel (so clams are included in it). I promise this will be the last seafood dish for a little while, unless I am unable to control my seafood compulsion and if I come to that point, I think I will have to start doing yoga or meditation. I have been to my favorite store this weekend to the other side of the Bay and loaded my cart with so many wonderful goodies I thought I would never find. I think the day I will leave the Bay Area, I will miss this store so much, because at this point I have not seen something that amazing and exciting anywhere else, not even in any European city…just Berkeley, California. Berkeley I salute you. 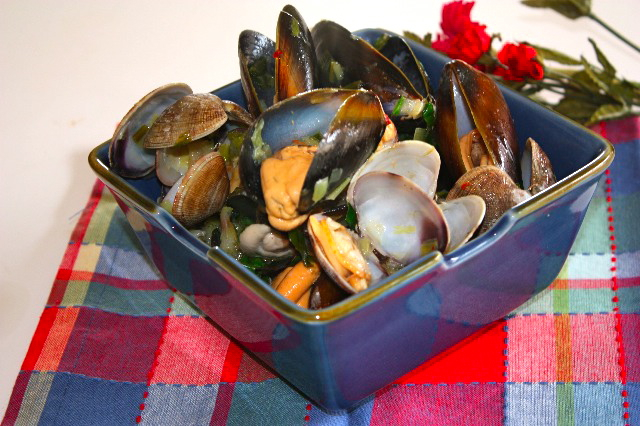 Mussels are so popular in Mediterranean cuisine, and moules marinières, probably the most common way to prepare mussels in Belgium (and in France too), and are on every menu of any French restaurant in the US. So enough of moules marinières, and let’s add un “petit piment” in our mussels. Dans la vie, il faut du piment!, we need some spice in your life, don’t we? Leeks and mussels go so well together, and here the broth is enhanced by lemon juice and chili, with a dash of beer, what a flavorful combination. I usually count 2 lbs of mussels per person, depending if you serve mussels as an appetizer or main course and the appetite of your guests. In a large pot, heat 1 tbs olive oil. Add shallots and garlic, stir and let it brown for a few minutes. Add leeks and cook until tender, then add chili flakes. Add mussels and clams to the pot. Stir well, adjust with salt and pepper. After the mussels and clams are half open, add beer. Mix well. Cover and let the mussels cook until they open completely. Add lemon juice and 1 tbs olive oil, stir and cook for an additional 2-3 minutes, at the end at parsley and basil. This entry was posted by silvia on March 1, 2010 at 11:13 am, and is filed under Appetizers, Express - Less than 30 minutes, Fish/Seafood. Follow any responses to this post through RSS 2.0.You can leave a response or trackback from your own site. I know what you mean; sometimes I get into this seafood frenzy too. I think is so romantic. It’s so nice to have mussels and clams with some nice wine and crusty Italian bread it’s like a party. And they are pretty affordable too. So it’s a win win situation. Yours looks very yummy. I love the leeks addition. I can have this any day. I will usually make a huge bowl just for myself. N sharing. Mussels are I think one of the most beautiful foods to photograph — the contrast between the dark shell color and the bright meat inside is dramatic. And the shell itself is so beautiful, often having swirls of light ivory and a bit of irridescent blue. Just beautiful!